Effective social media campaigns coupled with search engineSearch engineA website that provides a searchable index of online content, whereby users…//read more optimisation are key to building traffic to your site. Facebook Pages, not groups or profiles, are the best ways for news organisations to reachReach1) unique users that visited the site over the course of the reporting period,…//read more out to and engage Facebook users. Reach out to influential Facebook users in your audience to help build a core group of users. When you build your pagePageA document having a specific URL and comprised of a set of associated files. A…//read more following to a couple of hundred core, frequent users, consider an ad. Measure and adjust the content you share on Facebook – monitor Facebook and your own site analytics to see what content your audience responds to. The whole world is talking. Social media has exploded as one of the key digital phenomena in the last five years, and news organisations have rushed to catch the attention of the millions of people who spend hours each day following celebrities, friends and trends using social media. The growth of social media has been stunning. Facebook now has more than 800m users worldwide and is estimated to reach 1bn users by October of this year. Most of that growth in recent years has come outside of North America and Europe. It’s not just about Facebook. Web stats firm comScore says that Russians are the world’s most avid social media users, spending 9.8 hours per month on social networks, twice the global average. Russia’s vKontakte is used by more than 50% of the country’s internet users, double the usage rates of Facebook. Of course, the use of social media was on full display last year during the Arab Spring. 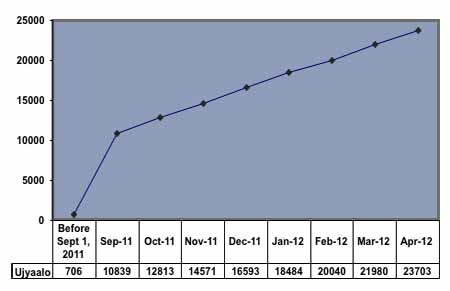 The Dubai School of government estimates that the number of Facebook users across the Arab world almost doubled from November 2010 to November 2011, rising from 19.9m to 36m. Savvy news organisations are tapping into this explosive growth, and the results can be very impressive. One only has to look at how Al Jazeera has used social media to fuel its rise, not only in the Arab world but globally. Al Jazeera English has more than 1m fans on Facebook, and Al Jazeera Arabic has twice that. It’s not just about being popular on Facebook. Social media can drive traffic to sites. 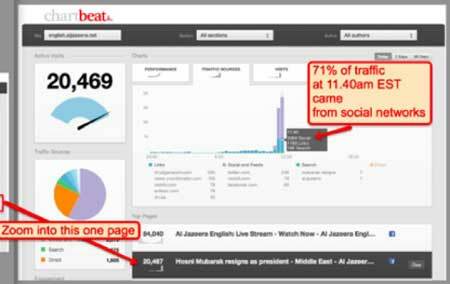 When Hosni Mubarak stepped down as president of Egypt, 71% of traffic to Al Jazeera English content came from social media, according to ChartBeat, a “real-timeReal-timeEvents that happen “live” at a particular moment. When one chats in a chat…//read more ” web analyticsWeb AnalyticsWeb analytics is the process of measuring, collecting, analyzing and reporting…//read more service the network uses to monitor traffic to the site. MicrobloggingMicrobloggingPublishing very brief, spontaneous posts to a public Website, usually via a…//read more service Twitter was the largest driver of visits to Al Jazeera English content, with social news site Reddit coming second and Facebook in third. Even more interesting is that most of the traffic went not to the text story on Al Jazeera English’s website but to the live stream of its coverage. By creating a link to a live stream of its broadcast, Al Jazeera English made television shareable, allowing people to clickClickA click can denote several different things. It can be a metric that…//read more a link from Twitter or Facebook and change the channel. Furthermore, Al Jazeera’s streamingStreaming1) technology that permits continuous audio and video delivered to a computer…//read more strategy helped it gain audience even in the US, where it had struggled to be carried on traditional satellite and cable networks. News organisations can get started using social media with very simple strategies, building on them as they see what works. One simple way to leverage the audiences on Facebook is to create a page. Pages are more appropriate for news organisations than a profile or a group. Facebook pages have business specific tools that will help you engage your audience and also to measure that engagement. They are indexed in search engines so can help increase your overall online profile. You can also message anyone who likes your page or target messages to specific demographic groups within fans of your page. Nepali radio network Ujyaalo 90 created a Facebook page in order to take advantage of the fact that the social network was the most popular site in the country, according to web statistics site Alexa. The small online team set up a Facebook page and linked it to their site so that a new post was automatically created every time they posted an article on their site. Facebook pages can use the many apps available on the service, and services such as RSS Graffiti allow you use RSSRSS (Really Simple Syndication)RSS or “Really Simple Syndication” is a process for publishing content on the…//read more or Twitter feeds to automatically post to Facebook pages. There is value in choosing what to post and carefully monitoring what your audience responds to both using Facebook Insights and also using your own site analytics. It’s key to see not only who comments on the posts in Facebook but also which posts on Facebook drive the most traffic to your site. The Ujyaalo 90 team in Kathmandu found that live reporting of cricket and football scores on Facebook and micro-blogging service Twitter were popular with users. Once you have a core set of users, it might be appropriate to create an ad on Facebook to promote your page. Facebook allows you to use the information that it has about its users to target ads to very specific groups, making sure that your ad reaches your audience. The Ujyaalo 90 team promoted the page to domestic and overseas Nepali Facebook users. The Facebook marketing campaign has been very successful, with the number of “fans” of the page increasing from 706 on 1 September 2011 to 23,703 by the end of the April 2012. Ujyaalo 90 aims to more than double its number of fans by the end of 2012, says Gopal Guragain, the executive chairman of Communication Corner, the parent company of the Ujyaalo 90 Network. After launching the page, visitors from Facebook rose rapidly, increasing in two months from 1% of the traffic to 13%. Since then traffic from Facebook has doubled, and it now is the biggest source of traffic to their site, according to Alexa. Creating a Facebook page is one simple step that has allowed a relatively small online staff to tap into the audience on the social network. The key to digital success is to constantly measure the success of not only your social media strategy but your digital strategy in general, making small adjustments when necessary to meet your editorial and business goals. Lastly, remember to make sure that your social media strategy benefits your site and not just Facebook. The ultimate goal is to drive traffic to your site and your ads, not just give people another reason to spend more hours in Facebook. Maximizing referrals from Google search and social media are essential elements in any strategy for building digital audience, and creating a Facebook page is a good first step to increase traffic from one of the world’s leading social networks.